In recent weeks, more than one of our friends has expressed how much they love oven roasted red potatoes. Cleo said a restaurant that she loves in Orlando serves Sage Roasted potatoes, then she said, uhm, maybe it was Rosemary Herbed Roasted Potatoes. Well, I have been making Rosemary Roasted Potatoes and Onion Roasted Potatoes for a few years now, but I do love Sage, so I set about to alter my good recipe and transform it into Sage Roasted Potatoes and have found it to be very good. Our neighbor Richard declared it so and asked for a copy of the recipe. Now, if only my Sage plant can keep up with the demands being placed upon it, we'll be in business! In case I have to give the sage plant a little rest, I have also included, and may I suggest the Rosemary and the Onion recipes too. Have fun! dried sage and two tablespoons of the sage butter in bowl. Sprinkle with salt and pepper. Potatoes should be well oiled. Transfer potatoes to 2 baking sheets and bake for 15 minutes,cut side down. Toss shallots in same bowl with one tablespoon of sage butter. gently, season with salt and pepper, and serve warm. 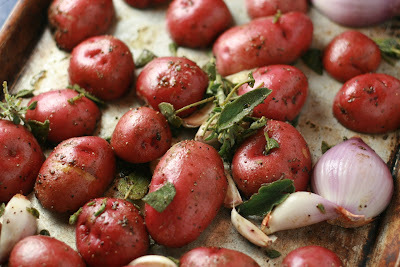 *Note, and variation: substitute fresh rosemary and dried rosemary for the sage and change the name to Rosemary Roasted Potatoes with Shallots. 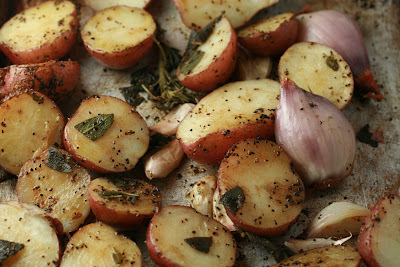 Sage and shallots sound great for roasted potatoes. My sage plants are still surviving and getting bigger each day, so I should be using it while I can! Lisa, Hi, hope you like them. They are great left-over too. Try them in a farmer's breakfast, with eggs. We like them re-cycled! Sage, shallots, and potatoes, what's a better combo?